Imagine for a minute that you’ve been feeling the squeeze of recent turns in the economy and had to let a few employees go. The decision is gut-wrenching, but you know for sure, you have to keep your star worker, Shawn. Shawn is a quick learner, the customers love him, and he’s always there to take up others’ slack. Unfortunately, the recent cuts mean he has to take on even more than you usually ask of him, but true to form, Shawn steps up to the plate. Then, the unimaginable happens and Shawn turns in his resignation to go work for one of your competitors. When you ask him why, he tells you that with all the hard work he’s taken on recently, he’s never once complained, but in truth, he has started to feel like it was all going unrecognized. “Even just a plain old: Thank you, I see how hard you’re working, would have gone a long way,” he tells you. And with your help, a bad situation, has just gone from bad too much worse. When hard work goes unrecognized, it’s difficult to imagine who would do it all again just to have the same results. Studies on employee recognition back this up time and again. Gallup, who has polled over four million people on the topic, reports that the benefits of employee recognition and reward programs are numerous, including: increased productivity, better employee retention, and higher customer loyalty and satisfaction scores. One study shows that only one in three US employees would strongly agree that they’ve had their work recognized recently, and that workers who do not feel adequately engaged in this way are two times more likely to say they’ll quit in the next year. Another study even showed significant increases in blood pressure for healthcare workers who you don’t like their boss. So the risks of under-appreciation are real. According to Business Journal, employee recognition programs, which often cost little in time and resources, may truly be, “One of the greatest missed opportunities for leaders and managers,” today. Recognize and reward for a job well done. 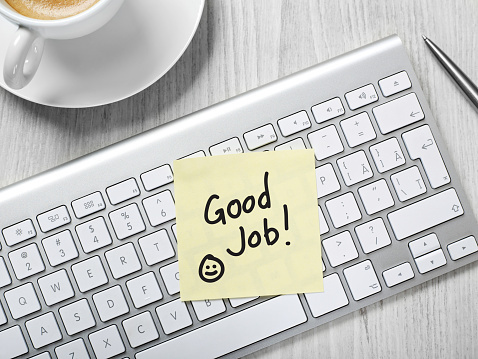 Make recognition public through emails, newsletters, events, bulletin boards, team meetings and social media, so coworkers and clients can see individual accomplishments. Create an internal tracking system to validate efforts and monitor progress. Reward employee performance though public events like company parties. Be authentic and specific in your praise, and avoid any sort of form letter certificates or emails. These days, after seeing proof of the tangible benefits, more and more businesses are heeding this call and adopting employee reward and recognition systems. Not only does this kind of engagement motivate employees to perform better, but also highlights which behaviors and outcomes the business really values. We, at ReviewBuzz believe in helping good people and business get noticed. The program we’ve designed and shared with thousands of businesses so far helps them leverage the power of people through employee rewards, public recognition, and people-powered online reviews. It only follows that our internal culture thrives on reward and recognition as well. For example, we give out a weekly honor tied to our core company values called “The Honey Badger Award” where one person is recognized for they way their work has reflected our core values. With the Honey Badger, the previous week’s winner gets up at a Friday, company-wide lunch and speaks about the new recipient for a minute and a half. 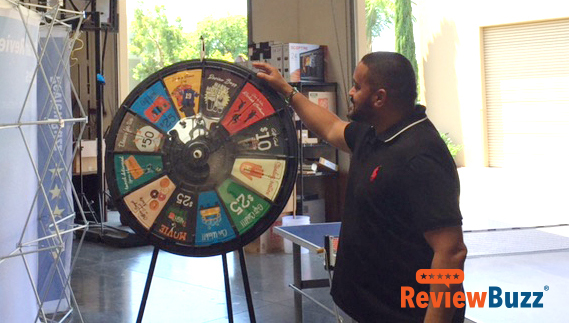 The new winner then gets up to receive a gift card, and a chance to spin a giant wheel with prizes. Wheel prizes can sometimes even benefit the whole company, like “Pick a Theme Day,” or “Happy Hour,” not to mention the now infamous “Dance Like Michael Jackson.” This one must be done in front of the whole company with MJ music playing in the background, while the team rightfully chants “Michael, Michael, Michael” as the wheel spins. Of course, the award wouldn’t be complete without the ultimate prize: a sassy stuffed honey badger brimming with the playfulness and camaraderie we hope to encourage in our workplace. Because the Review Buzz software is designed to help every business put recognition and reward to work for their bottom line, we love hearing stories of these kinds of successes from our clients. Clients like Blanton’s Heating, Air, and Electrical, of Fayetteville, North Carolina, whose innovative tier-based reward system offers employees unique experience-based prizes for their excellent work. These rewards include a paid day off day spent fishing with the boss, a plus-one Ruth’s Chris dinner with him and his wife, date nights and weekend getaways for two, and other imaginative lures. Rachel Hyatt of Blanton’s says that the incentive program we helped them engineer has really paid off. She notes how the incentives really got the team excited and motivated them to ask for more customer reviews. She told us that Blanton’s earned more reviews last quarter than they did in all of 2015. It’s human nature to criticize rather than compliment, and memorize mistakes rather than reward achievements. But let’s face it, the old adage that you catch more flies with honey was popularized for a reason. No one feels very motivated when hard work gets skipped over, and feedback is solely critical. Noticing the good guys doesn’t need to cost a lot of money or time, pays off in real ROI, and can really be fun. But if you’re not already doing it in your company, don’t beat yourself up. Start focusing on the good, and the rest will follow.